For a long time, I’ve been wanting to dive into the big, big topic of Houston, Texas, a big, big town with an appetite for development. I’ve been going to Houston every year or so ever since I was a kid. When I was younger, we’d go to the enormous Galleria Mall, with its enormous ice-skating rink under a great glass barrel vault a London’s long-gone Crystal Palace. Now my sister lives there with her growing family so when I visit I’ve finally got a chance to see Houston beyond the highways and the malls and the sprawl. I’ve always seen Houston as a product of a mostly out-of-control version of American twentieth-century urbanist thought. Now I’ve come to appreciate that product, even if I’m wary of it. But of course, there’s much more to Houston than the hour-long rides on the freeway, much much more than can be talked about it one post. 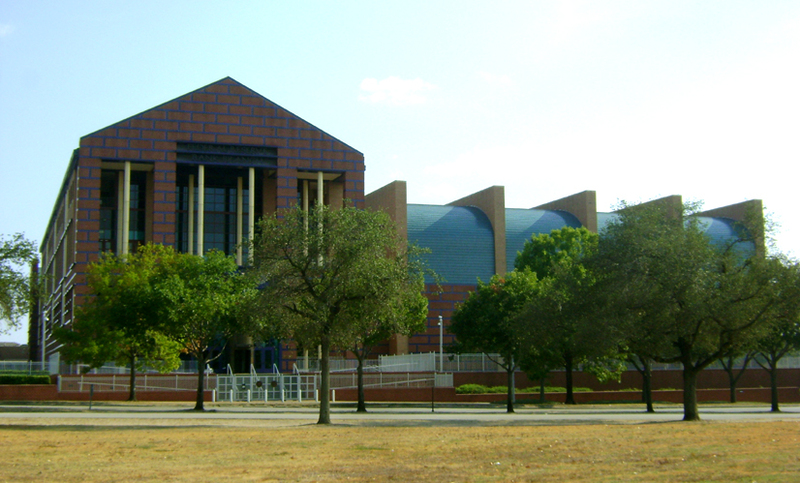 Michael Graves' Federal Bank of Dallas Houston Branch Building. Photo by author. I’ll start with a building in Houston’s Fourth Ward, located along park-lined Memorial Drive stretching west from downtown to Memorial Park. 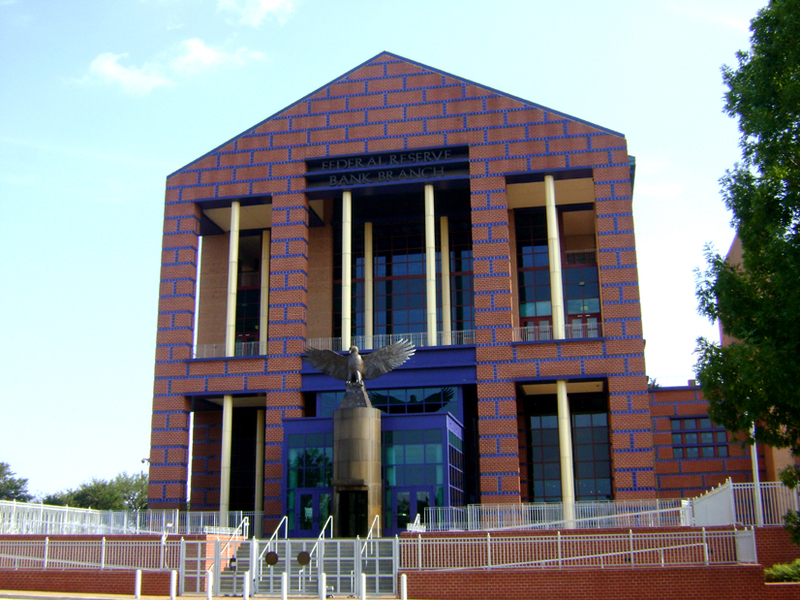 The Federal Reserve Bank of Dallas Houston Branch Building was completed in 2005 and stands pretty much alone along the green parkway lawn that runs in tandem with Buffalo Bayou, Houston’s main waterway. The Houston Branch Building was designed by the architect Michael Graves, well known for his postmodernist structures among which the Portland Building (Portland, Oregon, 1982) stands out. Here in Houston, Grave’s creation sits on its park-side site truly like an objet. It’s convenient that the building conveys this quality of spectacle on its exterior – I don’t think there’s any chance of visitors being allowed inside! Twenty years after the Portland Building made him an international architectural superstar, Graves here in Houston composed the Houston Branch building with the same palette of postmodernist tricks. The Houston design’s symmetry, its modified temple front, the eagle attempting flight before the front doors, the sly use of blue glazed tile to give the not atypical red brick facade the not-quite-illusion of heavy masonry coursing. The Houston Branch Building, I think, can speak for a large part of Houston’s own vision of contemporary architecture. Aesthetically, Graves’ design dismantles Western architectural history and reassembles it in Houston’s own image. It is triumphant, playful, and oversized, heavy on the symbolism that to many still conveys stability, security, and patriotism. Inside, however, I suspect the interior is not unlike any other well-funded Houston office building, with a lobby or meeting space that outshines the rest of the building but that is still draped in the abstracted classicism still so popular today.